AUSTIN, Texas -- A shooting in a crowded entertainment district in downtown Austin early Sunday caused a chaotic scene, leaving one woman dead and three others wounded and police searching for a suspect. Austin Police Chief of Staff Brian Manley says police received reports of gunshots in the crowded entertainment area shortly after 2 a.m. Sunday, and found that five people had been shot. "It was a very chaotic scene," Manley said. 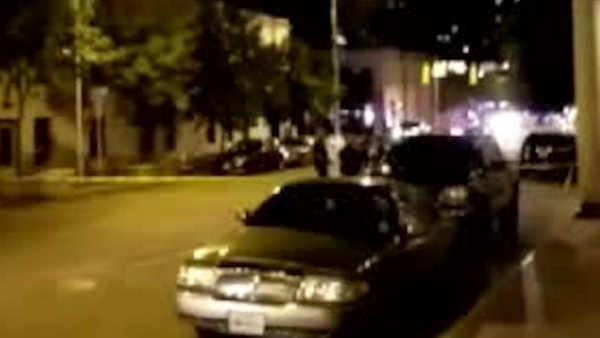 "A lot of people running in different directions with all the gunshots coming out." One woman was pronounced dead at the scene, and three other women were taken to University Medical Center Brackenridge with injuries that were serious, but not life-threatening. Manley said another victim declined to be transported to the hospital. Austin Police Chief Art Acevedo said in a statement Sunday that his department is working to identify and arrest the person responsible for the shootings, and urged people who have video of the shooting or the aftermath to send it to police via email. Manley didn't rule out that a suspect might be one of the people transported to the hospital. "We have multiple individuals, witnesses, that we are currently interviewing," Manley said. "We had one individual who was initially noted as a person of interest, however that person's status at this point is undetermined." Manley said because of the large crowd presence, police were getting descriptions of a suspect from witnesses. However, he said the descriptions were consistent, to an extent, but not all the same. Police originally reported an active shooter scene in the area, but Manley said two separate incidents caused the confusion. He said there was another confrontation in a nearby parking garage and that a shot was fired there. A man was transported to the hospital after that confrontation, but his condition was not immediately known.